Wild Cherry candy drops. 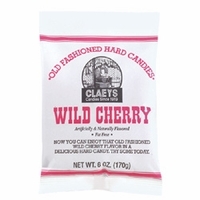 You can now enjoy that old fashioned Wild Cherry Flavor in a sanded hard candy. Claey's candy is known for there old fashioned drops. This is a fat free candy with approx. 17 calories per drop. With a long lasting delicious wild cherry flavor. These old time treats are made with a sanding process. Old fashioned sandy drops are a vacuum cooked hard candy coated with a thin layer of extra fine sugar crystals. These sanded candies come in many flavors so why not try all of the. Choose from Sassafras, Lemon Drops, Sour Apple,Anise,Watermelon or Horehound.